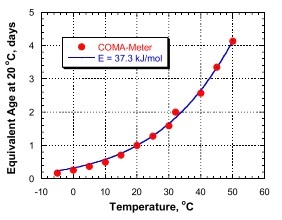 A glass capillary contains a liquid for which the rate of evaporation varies with temperature according to the Arrhenius equation, which is the same function that is used to determine maturity of concrete from its temperature history (see pg. 75). 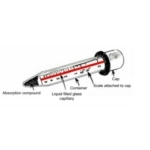 The closed capillary is placed on a card with a calibrated scale indicating maturity in equivalent age at 20 ºC. The card is attached to a cap that fits into a transparent container. After the concrete is cast, the capillary tube is snapped at the zero mark on the scale, the cap is pushed into the container, and the container is inserted into the fresh concrete. 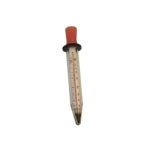 The temperature within the container will stabilize quickly with the temperature of the surrounding concrete. 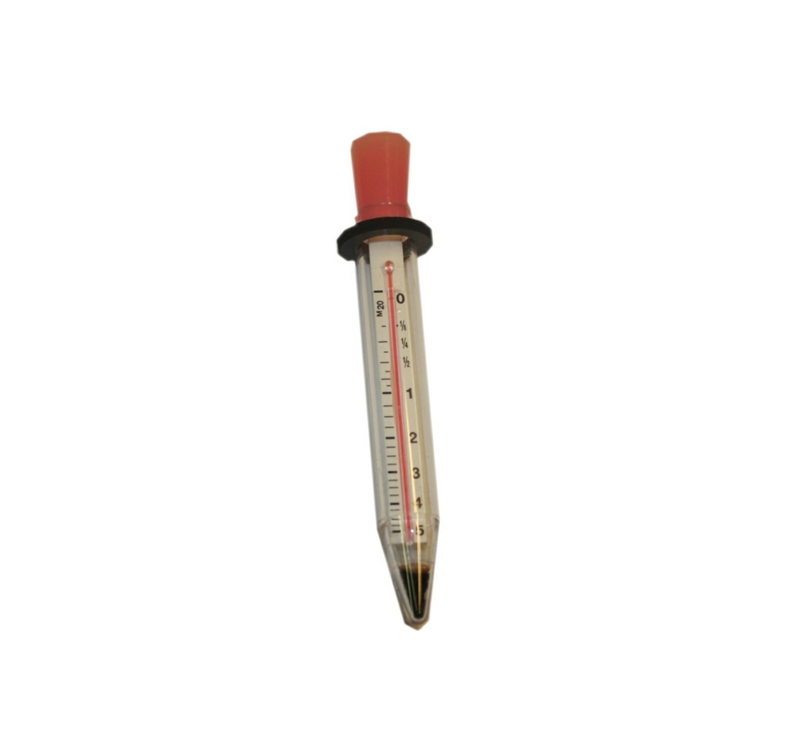 The liquid in the capillary tube evaporates at a rate determined by the temperature and time. 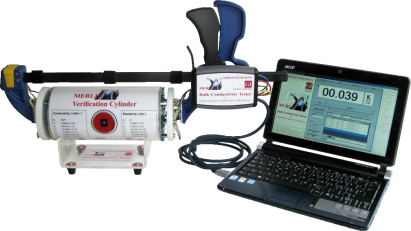 The level of the liquid, readable on the scale, measures the maturity of the concrete stated in M20 units, which is the number of equivalent days of curing at 20 ºC. 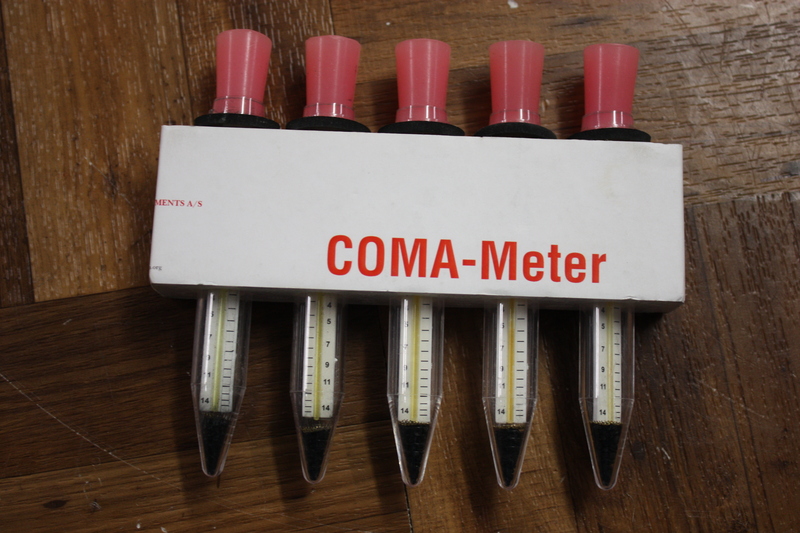 The measuring ranges of the two types of COMA-Meters are 0 to 5 M20 days for the COMA-5 and 0 to 14 M20 days for the COMA-14. The scale allows the maturity to be estimated to within ±0.1 M20 days. The meter is accurate to within ±5 % compared with maturity values calculated from temperature readings as shown on the previous page. 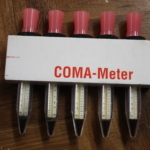 The activation energy E for the COMA-Meter is about 40 kJ/mol. 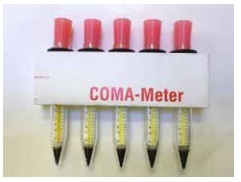 The basics steps in using the COMA-Meter are shown below. In order to estimate the in-place strength, the strength-maturity relationship for the concrete mixture needs to be developed beforehand. 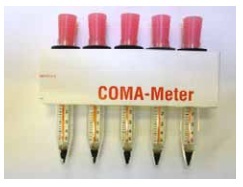 The detailed procedure is given in ASTM C1074, but basically a set of standard specimens are made in the laboratory. 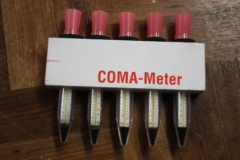 A COMA-Mater is installed in two specimens. At ages of 1, 3, 7, 14, and 28 days, at least two replicate specimens are tested for strength and the average maturity is recorded. 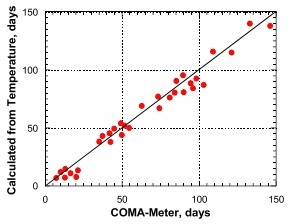 The strength-maturity data are plotted and a best-fit curve is determined and used for estimating the in-place strength. 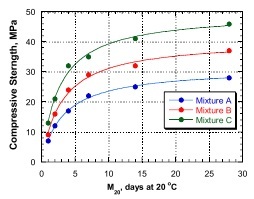 The plot on the right shows examples of strength-maturity curves for three concrete mixtures.